Securing fundamental individual rights, as well as the rights of the people as a whole to govern themselves through consent is the principal object of the republic envisioned by the Founders like James Madison, James Wilson, Alexander Hamilton, and George Mason. We find in Federalist No. 10 (1787), however, another characterization of what Madison calls the “first object” of government that is worthy of more consideration than it generally receives. “This term [property] in its particular application means ‘that dominion which one man claims and exercises over the external things of the world, in exclusion of every other individual.’ In its larger and juster meaning, it embraces every thing to which a man may attach a value and have a right; and which leaves to every one else the like advantage” (James Madison, “On Property,” 1792). “His opinions and the free communication of them…his religious opinions…and the safety and liberty of his person. He has an equal property in the free use of his faculties and free choice of the objects on which to employ them. In a word, as a man is said to have a right to his property, he may be equally said to have a property in his rights” (James Madison, “On Property,” 1792). In other words, a legitimate and defensible free government is one that protects people to exercise their faculties to the end of becoming the people that they want to be. Considering the way of life that he was advancing for the American people, it is not surprising that Madison subscribed to a broad definition of the right to conscience, embracing freedom of religion and more, as well as the right to property. It also is not surprising in modern times, though it was to many of Madison’s contemporaries, that he believed that the best way to protect people’s exercise of their faculties to the fullest, was to craft a self-governing republic. The Framers envisioned a governing structure that would advance the people’s prospects for securing happiness and safety, by developing what they called an “energetic” government with proper restraints on its power. Madison and other Founders believed that a robust private sphere subject to limited governmental regulation and populated by persons who are incentivized to use their talents and ambitions to the fullest should be beneficial for the individuals themselves and for the entire nation. 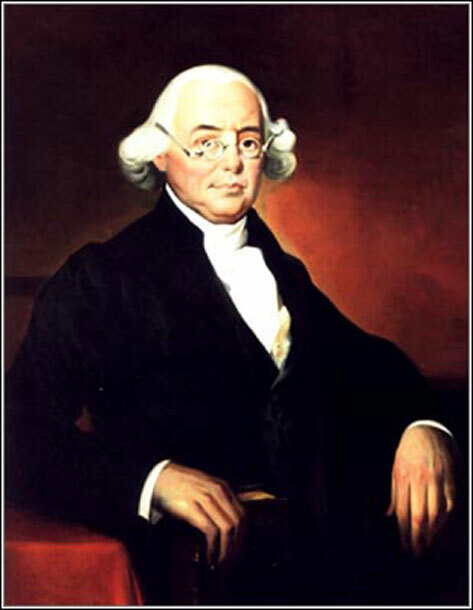 James Wilson signed the Declaration of Independence, was a member of the Conferation Congress, and was a delegate to the Constitutional Convention from Pennsylvania. He later served as a Supreme Court Justice. As intent as the Framers were on protecting individual liberties, they also appreciated the need for effective and competent government. Madison knew the dangers that can spring from the unbridled pursuit of narrow interests and, thus, recognized that government must be capable, when necessary, of restraining such harmful pursuits. Even a free people needs to be “controlled.” Indeed, Madison bluntly acknowledged in Federalist No. 51 (1788) that the first task of the delegates at the Constitutional Convention of 1787 was to insure that the government would have adequate power “to control the governed.” Adequate power is not the same as unlimited power. The trick is to come up with an arrangement that combines the requisites of effective government with proper and necessary safeguards for the liberties of the people. There are many working parts—the “auxiliary precautions” in the system that Madison and the other leading Founders proposed to achieve the twin goals of effective and safe governance. Governmental powers should be limited and their use must be subject to both internal and external checks. Governmental powers, however, also need to be adequate to the challenges that societies face, both domestic and foreign. In this connection, the Founders drew on what Hamilton in Federalist No. 9 called the “new science of politics” for guidance. This “new science” included a study of previous republics, to discover how to make government both free and effective. Most recent in the Founders’ experience was the government established by the Articles of Confederation—a “firm league of friendship” that had been too weak to provide an effective form of government. This was to be a republic that worked—not one that failed as all previous attempts had. They were well acquainted with the claim that liberty and safety are best secured by a government of separated and divided powers, accompanied by proper checks and balances. The Framers’ republic went one step further by dividing power between two “distinct governments” to cite Federalist No. 51—the federal level and the state level, and then subdividing power among separate departments or branches within these governments. Since the new government would be given national powers equal to the national needs of the country, the Framers proposed a bicameral legislature with substantial power to regulate interstate and foreign commerce, for example, but with contrasting chambers. The House of Representatives would be larger, providing proportional representation based on each state’s population, and elected by the people directly, for a two-year term of office. The Senate, whose two members from each state would be selected by that state’s legislature, would be a smaller, more deliberative body, with each Senator elected for a six-year term, and more oriented to representing the interests of the state. The Framers intended that, with their different constituencies and characteristics, the two chambers would check and balance each other and thus diminish the threat of legislative tyranny. The independent executive department headed by a single individual was designed to be a source of energy, but accountable energy; while the independent judiciary was expected to advance the end of having a ‘quality’ democratic republic that promotes justice in practice and not merely in rhetoric. Madison’s defense of the constitutional system of checks and balances in Federalist No. 51 makes it clear that he aspired to create something more than a mere democratic government, a ‘quality’ democratic republic was what he was offering the American people. Witness, for example, his defense of an appointed rather than elected national judiciary, a defense that rested largely on the benefits of a competent judicial department populated by officials who understand the complexities of the law. If the powers of the national government had to be properly structured or arranged to achieve the objectives of the leading Founders, so the division of powers between the national government and the states had to be properly arranged as well. The division under the Articles of Confederation favored the states to a degree that worked against the promotion of the “safety and happiness” of the American people. Madison explained in Federalist No. 39 (1788), that the nature of the new American republic was to be “compound,” or partly national and partly federal. An ingenious system, it would provide, as Madison further noted in Federalist No. 51, a “double security” for the rights of the people: “[t]he different governments will control each other, at the same time that each will be controlled by itself” (James Madison, Federalist No. 51). Enhanced security for rights, however, is not the only advantage of America’s federal or divided allocation of governmental powers. The decision to divide power among (federalism) in addition to within (separation of powers) several governments made it possible to enjoy the benefits of a large republic (e.g., strong defense against foreign encroachments, national system of commerce, multiplicity of interests that favored coalition or moderate politics, etc.) while permitting the American people to enjoy significant control over their day-to-day affairs within the states. The states, and not the national government, were entrusted with the all important “police powers,” that is, the authority to protect the health, morals, safety, and welfare of the people. 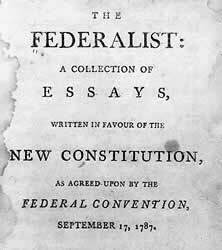 The Federalist Papers, written by James Madison, Alexander Hamilton, and John Jay emplored the people of New York to ratify the new Constitution. In short, the state governments that are closest to the people, and thus most subject to popular pressure, are left with control over the civic and cultural matters that are most likely to touch the people as they go about their daily lives. The sovereignty that the states enjoy, however, is a ‘residual’ sovereignty and not the ‘complete’ legal sovereignty that they enjoyed under the Articles of Confederation. As itemized in Article 1, Section 9, the U.S. Constitution restrains the states even as it restrains the national government. Review of state action by the national judiciary follows naturally from the provisions of the Constitution. Madison and some other Framers believed that infringements of rights were more likely to arise from state action than national action, in large part due to the broad powers of the states over the day-to-day affairs of the people. In short, Madison recognized that preserving the states as important political entities within the larger constitutional system would bring risks as well as benefits. It is instructive that Madison lobbied unsuccessfully during the congressional debates on the Bill of Rights for a constitutional provision or “amendment” that would specifically restrain the authority of the states to interfere with freedom of the press and freedom of conscience. He had been equally unsuccessful in convincing a sufficient number of delegates at the Constitutional Convention of 1787 to agree to empower Congress with the power “to negative all laws passed by the several States, contravening in the opinion of the National Legislature the articles of Union…” (James Madison, Records of the Federal Convention, 1787). The American compound republic combined national and state governments equipped with powers equal to their diverse roles, with the lessons of the Enlightenment’s “science of politics.” The structural or institutional features of the American constitutional order only make sense in the context of what the Founders hoped to achieve—securing the right of the American people to live decent, worthwhile lives according to their own goals and faculties. The thoughtful preservation of those institutions, occasionally through necessary corrective measures, depends on a proper understanding of what it is that they are designed to promote as well as an appreciation of how to manage those institutions to serve the best interests of the American people. All of this requires a citizenry with the skills and dispositions necessary for republican self-government, that is, a citizen body whose members understand and act to promote justice. Each successive generation must equip itself to assure a competent and decent rights-oriented republic (e.g., commitment to due process of law, the protection of fundamental personal liberties, tolerance of the exercise of necessary governmental powers, etc.) and to invest itself in the work of protecting and preserving such a republic.